Bar movement trackers. Peripheral vision training. GPS. They're all part of the ways schools are getting smarter of how they strength train. The white board in Paul Longo’s office looks how you would expect the Notre Dame director of strength and conditioning’s white board to look: a congress of numbers and names, featuring the weekly training regimen for the Fighting Irish’s football team this summer. The names of each day’s exercises run in vertical lines made up of colored cards: WHIPSNATCH on a green rectangle. TURF MOBILITY on yellow, CLOSE GRIP BENCH on red. In the Guglielmino Athletic Complex’s nearby weight room, players will grunt through all of these as they aspire to be a top-10 unit in the fall. But in a long conversation about how you train a top-10 team, Longo doesn’t refer to these lifts even once. As for what’s increasingly crucial to that mission, what the 28-year strength coach really wants to talk about, Longo reaches to his left for a leather bag. He pulls out a small device and lays it on his desk. It looks like a digital watch, circa 1985. It is, in fact, a Basis tracker, one of Longo’s newest toys, arriving in early June. When one of Notre Dame’s players wears the device, the strength and conditioning staff will be able to track the amount of sleep the player gets, the quality of that sleep, his heart rate upon waking and other variables. The data may offer clues as to why a player is sluggish or not recovering well from workouts, be it stress or over-training. Those clues may inform an adjusted plan to keep the player sharper and healthier. Or they may prompt Longo and his staff to lecture a player on better habits. Either way there is objective evidence at Longo’s disposal. The interpretation is the art of it, but the numbers don’t lie. As programs across the nation begin their summers of training for the 2015 season, strength and conditioning is increasingly becoming a complex numbers game. The question is not only how much you lift but also how efficiently you lift it, how you train muscles literally from head to toe, how you feel before and after and all the forward-looking ways to measure those nuances. Out of the Stone Age, into the Information Age. To accomplish that, programs have gotten, well, programmed. Schools like Notre Dame, Northwestern, Nebraska, Texas A&M and others use a system called EliteForm, which tracks the speed of bar movement and the watts produced during exercises and then displays the results not only for the lifter but also on interlinked tablet screens hanging on stations throughout the weight room. Cincinnati is entering its sixth season using Dynavision, a large light board that helps hone ocular reaction time and enhance peripheral vision—essentially a workout for eye muscles. Many schools, USC and Florida State among them, use trackers like Catapult GPS to monitor the work rate of players or position groups that do a lot of running. Not every innovation is worth exploring, and encouraging players to strain against their limits, whatever the numbers say, remains a key component to any strength program. Old school isn’t out entirely; at Northwestern, a good old tug of war remains part of training. But there are only so many hours in a day a player can work, and there are only so many players on a roster. Efficiency, therefore, becomes key. At Notre Dame, touchscreen tablets latched to a line of weight racks measure progress—both in the technological sense and the conditioning sense. EliteForm was established in 2012 and it arrived in South Bend in early ’14. The essence of performance has not changed over nearly three decades, in Longo’s estimation: It is about force production into the ground—what your legs and core put in determines what propels you forward or upward. EliteForm, by calculating bar speed and weight and translating that into watts produced, allows Longo and his staff to get their most accurate measurement of the player’s force. “Power is pretty simple,” Longo says. Proving the point, he in fact scribbles the equation for it on a sheet of paper on his desk: (m x d)/t. Mass times distance divided by time. The Olympic-style lifts that Notre Dame does stimulate and adapt force production and basic power. During a particular lift, the EliteForm radar collects all the data and flashes a number on the touchscreen tablet attached to the rack. If a player misses his target, the number appears in red. If he hits or exceeds his target, it appears in green. Indeed, if a player produces the best number of the day across every rack in the room, it appears in yellow for everyone else to see…and envy. And it remains there until someone beats it. With GPS devices becoming more ubiquitous in college football, there is that same desire to know hard numbers—but aimed at ensuring a workload doesn’t squash a player completely. Technology in college football: How can mobile apps impact recruiting? It’s also being able to better validate a practice plan; should coach Steve Sarkisian want an intense workout, the data spit out by the Catapult device will reflect whether he got what he wanted. But as intent and excited as Lewis is about continuing to use Catapult—“It’s just the beginning,” he says—it cannot box players in. Nothing of any appreciable worth in athletics gets accomplished without players attempting to transcend boundaries or limitations. Then there are the muscles that aren’t typically the focus of exercise. Cincinnati began peripheral vision training in 2009 because Bob Mangine, the school’s associate AD for sports medicine, and his staff were concerned that concussion treatment and discussion revolved too much around what occurred after the fact. A better system, they reasoned, would reduce concussions by helping players see the hit before it comes. Enter Dynavision, used by the Air Force at the time to enhance its pilots’ peripheral vision. It is essentially a large 5-foot by 5-foot board featuring a small screen in the middle and rings of lights around it. A player focuses on a word or number on the screen, then reacts to a light on the periphery by reaching for it. The applications of Dynavision evolved beyond injury prevention once its efficacy became evident. 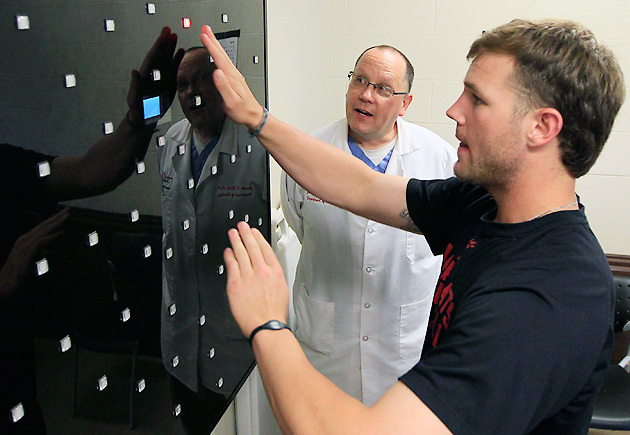 Cincinnati now has programs for receivers, quarterbacks and offensive linemen that train their eyes’ reactions for their responsibilities on the field. The Bearcats’ wideouts, for example, stand at an angle before the Dynavision board, head turned toward it with their finger on a green button. When a red light goes off, the receiver must hit it and then turn his head to find a ball that has been thrown at him at the same time. The years of Dynavision’s proven results prompted Longo to order one that will arrive at Notre Dame for training camp—“That one is going to be fascinating, especially when you start training some of the young kids,” he says—but the accumulation of gadgets and gizmos has not eliminated the room for more visceral training methods and philosophies. As Longo demonstrates the function of EliteForm one afternoon at Notre Dame, star Irish linebacker Jaylon Smith is a few feet away, executing a traditional bench press…with 40-pound chains hanging from each end of the bar, in addition to the steel plates. It is a decidedly low-tech answer, Longo explains, for minimizing negative motion at the top of the lift. The chains add weight as Smith’s arms accelerate, helping him develop a stronger burst. Otherwise, he’d effectively be a boxer practicing pulling his punches. A couple pieces of scenery in his office underscore that. Just inside the door, hanging off a coat rack, is a silver and white football jersey. It is the All-Pro uniform top worn by Jason Kelce, a star center for the Philadelphia Eagles and a former Longo protégé at Cincinnati. Kelce arrived as a 250-pound walk-on linebacker and, to his former strength coach, represents proof that the one common trait of all great players is stamina, or power endurance. “And power endurance has to be earned,” Longo says. A peek at the inscription in the bottom of the ‘2’ on Kelce’s No. 62 jersey suggests the good players know that. I wouldn’t have this if it weren’t for you, Kelce wrote in black marker. The motivation to go beyond mere hard work—to quantify what actually is efficient hard work as precisely as possible—exists on that dry-erase board, opposite the workout schedule. There, Longo has written Notre Dame’s records from each season, dating to 2010. He also has noted how many points separated the team from significantly better—or worse—records. In ’12, the year the Irish reached the BCS title game, Longo estimates the team was seven points from going 7–5 instead of 12–0. Conversely, in ’14, eight points separated Notre Dame from 11–1 instead of 8–5. The conclusion here, just like the equation for power, is simple: Winning close games requires being in the position to win them. This is where the numbers may come in.